Tusheti is a remote northeastern region of Georgia located on the northern slopes of the Greater Caucasus Mountains. It is reachable from the mainland with by the only unpaved road which is crossing 2850 m Abano Pass (Ministry of Economy and Sustainable Development of Georgia, statement on this project. Please find info on this). The project was implemented by constricting local high-speed fixed wireless network with backbone and access systems’ installed at remote, rigid location at elevations reaching 3500 meters above sea level (ISOC, Clearing a path to the outside world. Please see info on this). The project opens new development avenues for tourism and preservation of unique local culture, provides essential communication channel in case of healthcare and other emergencies, supports economic sustainability of the region and creates opportunities for local community to establish business contacts, offer and sell local products and services. Through Internet connection, population can have access to online resources, use educational, E-heath and E-government services, access job markets. Tusheti is located on the northern slopes of the Greater Caucasus Mountains in Georgia and bordered by the Russian Federation republics of Chechnya and Dagestan. It covers 969 sq/km as one of the most isolated areas of Georgia. Tusheti comprised four mountain communities. The largest village and center in Tusheti is Omalo with a population of only a few dozen during the winter months when the road becomes impassable. When the intense traffic is parked for 6-7 months and Abano pass is closed, no one knows about locals conditions. Now there is community broadband internet in many villages, which is the only way for communication with family members in winter. Community internet network is covers 2/3 of the entire region and 85% of settled villages and provides access to various governmental and commercial services. 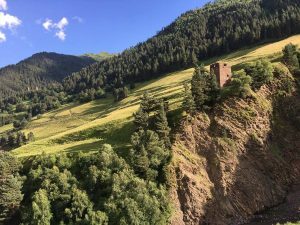 In Tusheti, the Internet is not just about globalization, economic development and enhancing connections. Here, the Internet can mean the difference between life and death. Population of Tusheti is low. Because of strict environment and remoteness it is very difficult to stay there in winter. Right now there are just 1,131 households, and 5,103 people (Geostat information for 2014) Living in 50 villages. In summer, Tusheti is one of the most visited region of Georgia, more than 14 000 tourists were visited this area in 2017 (Tusheti National Park Administration, please see). There are unique areas of untouched nature (Tusheti Protected Areas), villages and castles which are under the protection of UNESCO, here is the highest settlement of Europe – village Bochorna at 2,345 metres (7,694 ft) above sea level and one of the Europe’s largest National Parks (Tusheti National Park). From the middle of October, till the end of the May there is just one way to reach the destination – a helicopter. After implementation of this project, communities in the region for the first time have access to broadband Internet . Only half of Georgia’s population is hooked up to the Internet, according to the International Telecommunication Union. The access percentage fell along economic lines with remote and rural areas suffering the most. In this way, Internet connectivity is helping to the economic sustainability of Tusheti while also creating opportunities for communities to sell their local products and services. Tusheti is famous with his transhumance farming (The Altlantic, The Shepherds of the Tusheti Mountains, Alan Taylor, Oct 31, 2017, please see link) and it’s particular type of sheep cheese, and the locals hope to peddle that delicacy to a wider audience, as well. Remoteness of Tusheti heled to preserved local nature and unique culture. That is why this area is in high demand for local and international guests – adventurers, hikers and cultural tourists. Tourism grows so fast that now almost every family is trying to start small hospitality business, and good Internet connection is essential for communication with partners and access to popular online booking services. Good quality WiFi connection in hotels is also important to attract tourists that are not used to life without high quality Internet connection and also creates opportunities for development of event (MICE ) tourism as well. This provides stable revenue to cover networks operational costs, which is important for future sustainability of a project (ISOC, 2017, TushetiCaseStudy). Project is very important for local society members. Irakli Khvedaguridze is Tusheti’s 76-year-old doctor. He is the sole inhabitant of Bochorna in the winter, paid to stay and tend to the few others who stay in their respective villages. When local technicians arrived to install the antenna and get the network connection running, he was overjoyed, even though he does not yet have a smart phone, or even a computer. He recounted one winter when a tree fell on a villager, hurting his back. The man had to walk with his injury for three days through waist-deep snow to find someone who could contact Khvedaguridze. Even then, helicopters couldn’t reach him and a team of seven men had to walk from another village and carry him out on a stretcher. The doctor’s first thought was how much of this could be avoided with an Internet connection. Most importantly for many fulltime residents the internet is free and costs are covered by Tusheti Development Fund during the winter time, though, is the hope that the young people will have more reason to stay in the area. In essence, Internet in Tusheti serves as an additional service for tourists a connection for locals to obtain information and to contact to their family members and friends, both near and far. Those in the tourism industry can now focus their services without any intermediary. The bakery, Ia Buchaidze volunteers at the library in the village, teaching German to those interested. Community-minded, she is currently writing a grant application to for support set up a social enterprise that will make sustainable bags; proceeds from the sale of which will help disabled members of the community. For all these projects, the Internet is key! In August 2016, Taking into consideration common social interests to provide Tusheti residential settlements and tourist centers with the fixed wireless internet service and expressing desire of mutual cooperation and recognizing the importance of the mentioned objective for the development of Tusheti remote region, was signed MoU. Parties of MoU were from different stakeholders such as international organization (ISOC Georgian Chapter and ISOC European bureau, ME’s (“Small and medium sized Telecom Operators Association” and member of the association – LTD “Free Net”), independent technical experts and local society members Non-Governmental Organization (“Tusheti Development Fund” ). The target of the project was to build high-speed fixed-wireless Internet and ensure the operation and sustainability of the network by the Tusheti Development Fund and through involvement of local residents after constructing backbone radio network and transferring it to Tusheti Development Fund. In case of availability of technical facilities, the Fund has no right to refuse internet service delivery to any point of Tusheti (ISOC press release 2016). Following activities have been realized within the project step by step: planning and procurement, construction of main broadband network – from Telavi region in the direction of Tusheti (43 Km leg) to Abano Pass and from Abano Pass to Diklo Mountain and to other 4 points on the top of the mountains (25-30 Km each). Network was launched in the end of July 2017. Establishing the network involved mounting transmission equipment on the masts and they beamed a signal from point to point across Tusheti. This had to be constructed at high points across the region (For full technical and budget info please find a link). From those masts, WiFi signals are beamed out to the villages where receivers are now installed. Installation and testing activities wares done in 3 month – Starting in June of 2017, the equipment was transported to Tusheti, via helicopter, 4-wheel-drive, and even by pack horse. The project is sustainable both in its ability to power itself through just solar energy and in the local population now trained to use it. The network is owned by “Tusheti Development Fund”, that carries out the operation of network and final installation works to the subscribers. High involvements of the locals puts in place the physical, intellectual and monetary resources and understanding of society ownership of this network. Right now local’s Fund work well and is now able to manage this project with its own (whether technical or managerial skills). The network provided cost-effective Internet connectivity to dispersed communities located in challenging terrain. The amount of the profit for the mentioned activity shall not exceed 10% of all operational and capital expenses. Profit obtained from the mentioned activities shall be directed to the development/re-equipment and extension of wideband network and towards the promotion of interests for providing the region with the network. This equipment and solar panels had to be able to withstand intense thunder, wind, and snow. Sometimes the areas were so remote, high, and treacherous that it was impossible to set some of the masts in their original locations. Parallel activity from Government of Georgia – Ministry of Economy and sustainable Development of Georgia and Agency of Technology and Innovation of Georgia (GITA) was very important. Planning of the networks and other activities also was done with help of Georgian National Communication Commission. Ministry implemented complementary project (with support of World Bank’s so called “Genia” project) for local society member to encourage them and give knowledge about E-commerce and equip with Internet usage skills and finally also internet vouchers for installation (end users side). E-commerce training program aimed at reducing the tech literacy gap between urban and rural areas, together with a voucher program for equipment needed to connect to the Internet. Tusheti Broadband Project is related with Sustainable Development Goals: after implementation of this project all villages of the area are connected to the broadband Internet which is giving opportunity to organize small guesthouses and increase incomes for this High Mountain and low income region of Georgia (Goal 1. End poverty in all its forms everywhere and Goal 10. Reduce inequality within and among countries). 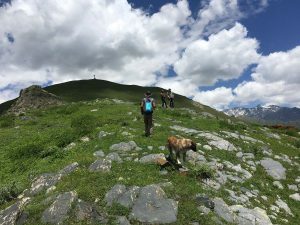 Tusheti Area is a protected area and broadband and full coverage of villages provides opportunity to organize appropriate network and control this space remotely and in online regime. Another point is also related with solar panel energy – network is based only on green solar energy and does not using generator and other type of electricity for Protect, restore and promote sustainable use of terrestrial ecosystems, sustainably manage forests, combat desertification, and halt and reverse land degradation and halt biodiversity loss (Goal 15.) This community network creates good possibilities for local SME’s development and poverty reduction. Tariffs for access are minimal and without profit, just enough for operational costs (Goal 8. Promote sustained, inclusive and sustainable economic growth, full and productive employment and decent work for all and Goal 9. Build resilient infrastructure, promote inclusive and sustainable industrialization and foster innovation). This network is base of the sustainable economic growth of this remote area, increase productive employment for locals and Make cities and human settlements inclusive, safe, resilient and sustainable (Goal 11.) This project has created IT skilled employment for each guesthouse in each village. Internet is a connection for locals to obtain lots of information and also contact to their family members and friends online (either abroad or other parts of Georgia). For guesthouses, internet make things easier on booking.com and alike websites to promote their services without any intermediary installing internet, many beneficiaries see already benefit, by attracting more tourists (for guesthouses) or contacting their families and friends often and checking information online (for inhabitants living in the remote gorges). Transhumance farming also promotes bio diversification. The project demonstrates that remote society doesn’t have to wait for others to get connected!